I haven’t always. I used to long for the days when the temperature would creep a little higher each day at about the same rate as the snow turning into dirt. When it seemed you could track the progression of change in season by watching jackets morph from puffy marshmallows to a thin layer added more for style than warmth. Then I got a dog and spring became a dirty word. I thought last spring was bad. Murphy had packed the snow in the entire yard down to create a thick layer of ice. When it began to melt, we had a lake in our yard covering what was left of the ice field. It was so bad that Murphy didn’t even want to go out there; he just sat on the deck and waited patiently for it all to soak into the ground so that he could resume his summer routine of afternoon naps in the sun beneath the pine tree. I’m not sure where he learned about battle strategies, (I leave HGTV on for him to watch when I’m gone, not the History channel) but Murphy has started constructing trenches in the backyard, a tactic that I am not very happy about. I thought I had a few more weeks of solid ground before I had to worry about the dog digging holes. I greatly underestimated the power of a determined dog, especially one whose nails are in desperate need of a trim (Have you ever seen a stuffed grizzly bear at a museum? You know what their claws look like? Yeah, Murphy’s nails look a lot like that. They are serious weapons of mass destruction.). He dug through a foot of soft snow, to the ground, and down about another foot. He did it with such force, that he blasted the back of the garage with mud. Perhaps he is creating camouflage to confuse the squirrels? His next plan was to create something of intrigue to attract the enemy. Since they’re hungry and they like to eat walnuts (he knows this because they sit in the pine tree and throw the shells at him – I’m not kidding, it’s actually quite amusing to watch) he dug up my soaker hose that I accidentally left in a garden over the winter and then proceeded to chew it into little bits of black rubber that resembled the squirrels’ favorite food. All in all, it was quite an impressive execution of a very sophisticated battle plan. I should be impressed. I’m not. Not in the least. If anyone has been thinking about getting a Golden Retriever, I might have one available if he doesn’t find a new hobby very quickly. But thankfully, I had a hobby of my own to turn to when I couldn’t deal with the devastation that was once my backyard. So I headed inside to the kitchen and made something that gave me happier memories of spring. My favorite part of spring is when the buds begin to appear on the trees and the green heads of the day lilies and hostas pop through the soil. It’s a sign that in a matter of weeks, winter will be but a memory and I’ll soon be sitting on the deck, bathing in the warm summer sun, reading a book and watching Murphy nap in the grass (if there’s any left by then). Aside from the braches that fell from the pine tree popping through the snow and reminding me that I need to do something about them, there hasn’t been much sign of green sprouting from the ground just yet. So to give the plants a little encouragement, I made a recipe that does a little “popping” of its own: Popovers. 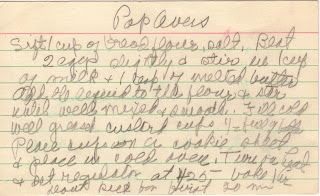 This recipe was like so many others in the box, something that I always thought was difficult until I tried it. Popovers really aren’t more complicated than cupcakes and they follow pretty much the same process (except for the frosting). I used an over-sized muffin tin and it made six popovers. The recipe instructs to bake them for 1 hour, however, mine were done in about 35 minutes. The kitchen smelled so sweet I wanted to bite into the air. It wasn’t sweet like cake or cookies, but instead reminded me more of bread baking with pancakes and drizzled in honey. The first bite was even better than I had envisioned. These are definitely my new favorite roll to serve with dinner. By the end of the weekend, 95% of the snow was gone from our yard. The record-breaking temperature of 64 degrees on Sunday helped accomplish that feat. And to celebrate, Murphy had his first picnic of the year (that’s what we call it when he eats his dinner on the deck). The bits of hose were removed from the yard, the pieces of broken pine tree braches were piled up, and even the hole Murphy dug didn’t look as bad once the snow was gone and the mud settled back into place. Maybe soon the hostas and the day lilies will begin to show their faces and then we can put this whole dreary winter behind us. When they do, I’d better warn them about Murphy’s militia because something tells me, they’ll be the next ones on his list. yes I hear you on messy Spring... luckily most of the WET is gone from our backyard and Odie our Corgi is staying relatively mud free --- thank goodness! Love Popovers! Thanks again Molly!